This New Years eve I'm looking forward to a simple night at home. No big fan fare, no cover charge and no waiting for a cab. The holiday season has taken its toll on me and I'm looking forward to curling up with a good movie; perhaps a rousing game of Wii tennis just to get the blood flowing. The food for the evening needs to match my casual plans: comforting but not heavy. December is prime mussel month and it would be a shame to not take this last chance to enjoy them. Adding tequila to a classic wine broth along with the lime really adds a punch to the mussels; these are stout, not for the faint boozer. The chorizo and roasted peppers add heartiness to the meal. 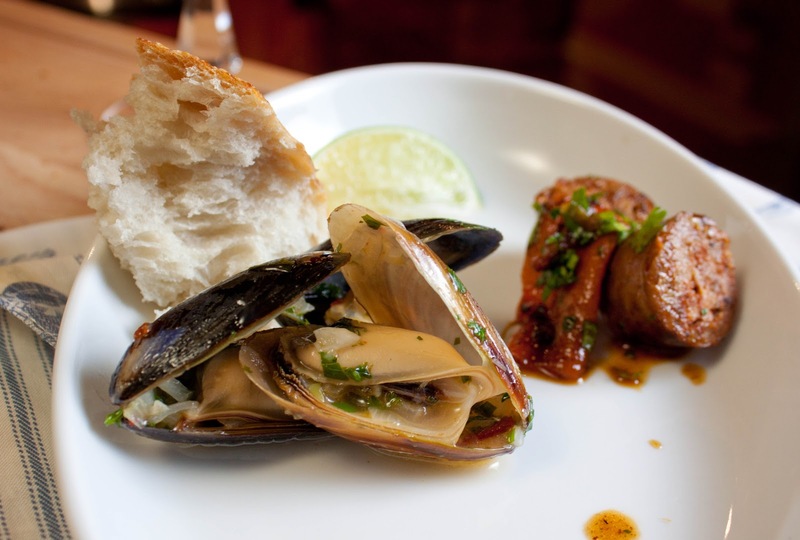 Enjoy Fat and Happy mussels and chorizo for the casual night at home. This dinner filled two of us with a few uneaten mussels and sausages left over. It could be stretched for four if you are light eaters and/or have an appetizer or dessert planned. You may already know that my family is crazy about Holiday cookies, making well over 50,000 every holiday. Those cookies are simply amazing. But I was challenged to come up with a new recipe that was drippy, gooey and downright screen licking good. 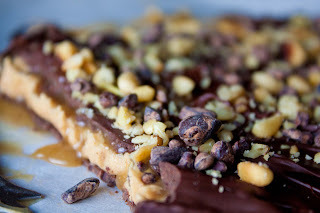 Two layers of chocolate, a layer of peanut butter, a layer of caramel and a topping of toasted nutty goodness with deep bittersweet cocoa nibs. Yup, that should do it. This is not a cookie for the tray. 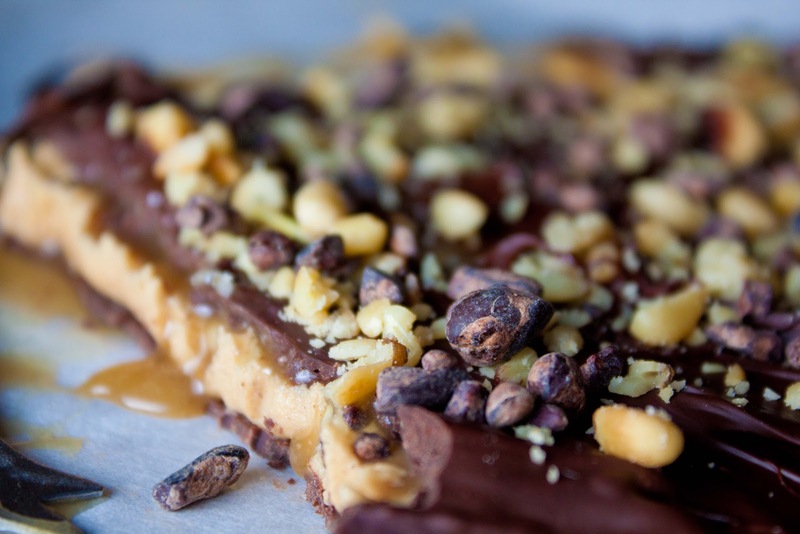 This peanut butter filled chocolate bark is going to leak gorgeous, gooey caramel everywhere. Hold off on cutting until you are ready to serve and enjoy fairly soon after cutting. The Fat and Happy holidays are upon us, celebrate now before the-January-days-of-detox are here. My family makes THE BEST CHRISTMAS COOKIES EVER! Hands down, they are the cutest, tiniest, most precious cookies you'll ever see. We make somewhere over 50,000 of them. I participated in Cookie Week again this year and it's honestly like going to math camp! Manning two ovens at different temperatures, each cookie needing specific minutes on both the bottom and top rack, while also making 2, 8 and 14 batches of 11 different cookies and keeping the number of cups of flour based on the butter ratio - 2/3 cup x 8- all in my head??? Math is hard- let's go shopping! But seriously, the time with the family can't be beat. We are all in it together and nobody leaves till all the cookies are baked...except for me since I live out of state and my plane departs on Thursday at 1pm. 2. The recipe is great for cookies and walls (for gingerbread houses). One night some friends and I took on the task of making a gingerbread house...in the form of Luke Skywalkers' boyhood house on Tatooine. Luckily this recipe makes an incredibly large batch because we ate as much as we decorated with; dipped in buttercream frosting we couldn't resist! 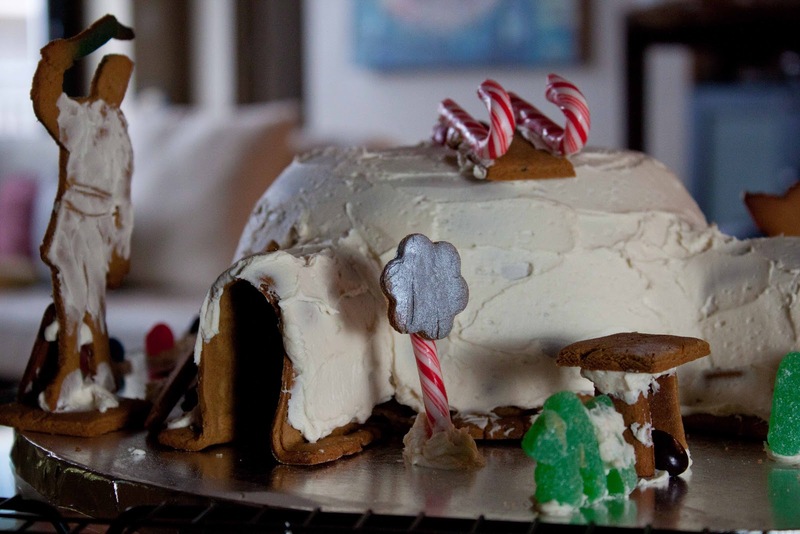 Whether cookies or architecture - everybody loves gingerbread. 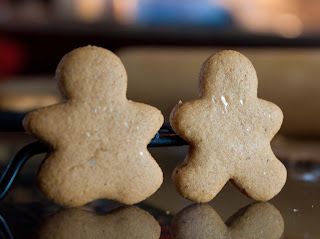 Don't hesitate making these fat and happy delicious gingerbread cookies today. Like it or not, the Holidays are upon us. My guess is that most of us enjoy this time of year but feel so much pressure for a myriad of reasons. The Walnut and Goat Cheese Stuffed Endive get an unexpected flavor boost from honey and jelly while the Cheese, Apple and Meat Skewers boast an unexpected herb treat. Reduce your stress (if even just a little) while enjoying tasty snacks at the same with these Fat and Happy appetizers. Every year we host a 'Left Overs Party' a few days after Thanksgiving for our friends and family. The goal of the party isn't just to eat up all the left overs, but to test my creativity and ability to come up with a new dish. One of the hardest left overs to work with was the remains of a pumpkin pie. To completely reinvent a dish would mean to turn a sweet dish into a savory one. This pumpkin mole does just that. With a hint of sweet to cool off the spicy peppers, this mole is delicious and screams Fall comfort food. Before we get into the recipe, let me state this is not a traditional mole with 20-some ingredients. But it is a simple, delectable, deep rich sauce; though it does not require a pumpkin pie. Roasted or canned pumpkin will work just fine. Set your leftovers free and you will be rewarded - hopefully with this gorgeous pumpkin mole! A meal is not finished until dessert is served. Don't get me wrong, I don't eat dessert every day. But you cannot throw a dinner party without the grand finale. It's like a fireworks show without the closing scene; it would still be good, but lacking something. Dessert don't need to be sugar laden or stuffed with chocolate to be amazing. 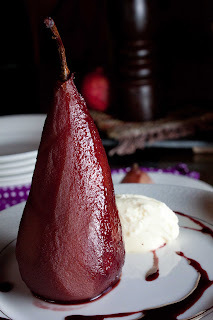 Case in point- these spice simmered pears served with a spoon of creamy mascarpone are elegant. Stunning. And surprisingly delicious. This is coming from an anti fruit-as-dessert person. The most difficult part is peeling the pears. If you can manage that, you can manage this dessert. Finish your meal with bang with these Fat and Happy Wine Port Pears. You can thank me later. Leftovers are hands down the best thing about a giant Thanksgiving feast. It's important to be creative so boredom between two slices of bread doesn't take away your eating enjoyment. 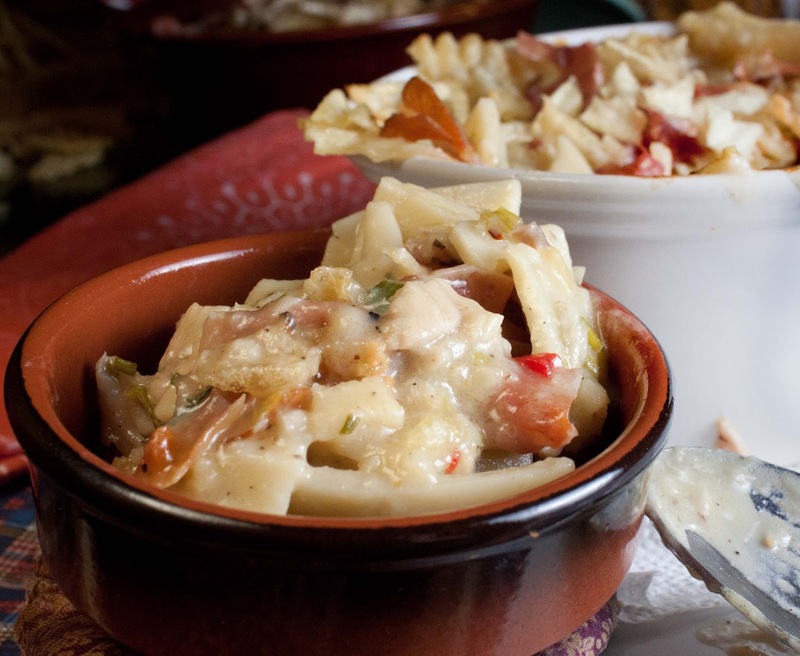 This macaroni and cheese recipe is the perfect place for leftover turkey. But don't stop there- use up onions, celery, peppers, even cranberries... have fun with it! The horseradish gives it a peppy zing. Keep your holiday eating fest going with this yummy fat and happy horseradish macaroni and cheese. Just be sure to get in your workout, this one is worth it. Thanksgiving is lapping at the patio doors. It seems to be approaching earlier than ever before and there is so much to do. The silver needs polishing, the napkins need ironing and the turkey needs brining. Brining- it's a funny thing. Similar to the marinating process, it's meant to help keep meat moist and flavorful through the cooking process by soaking the meat in a salt solution. Many swear by the wet brine. Dry brine, on the other hand, is more akin to rubbing seasoning on meat. Those who know it will argue that dry brining produces a better texture to the meat over a wet brine; it's definitely easier and less sloppy! Does it really make the turkey better? The meat juicier? The skin crispier? We enjoyed our super flavorful and moist turkey, though the pepper glaze may have had something to do with that. Dry brine your turkey, without our without the fat and happy pepper glaze, and then you be the judge. Then let us all know what you think. Contrary to popular belief, beer and ice cream do mix. Last year, The Bruery released their version of a pumpkin beer called Autumn Maple and I couldn't wait to cook with it. Rather than pumpkins, this beer is brewed with 17 pounds of yams along with spices and maple syrup. Consider it a bold sipping beer with a big nod to the booze. The warm fall flavors made me think of a holiday ice cream, a holiday beer ice cream. Genius. Reducing the beer concentrated the spice while the maple syrup adds that remembrance of home. The crispy, candied pancetta adds a smoky, earthy layer along with a little crunch. Because this beer has the full Autumn feel, I added a couple of coffee beans to help achieve that fantastic part of dinner where dessert-meets-after-dinner-drink-meets-coffee time. Enjoy Autumn through a bowl of creamy Fat and Happy ice cream. The beginning of November means it's time for another Recipe Swap. A group of intrepid food bloggers gather monthly (electronically) to recreate a recipe, chosen from a quaint recipe book, in our own versions. Carrot pie, our chosen recipe, is a dish of carrot quiche. The carrot is so simple and inexpensive, I was more than excited to work with this bunny-inspired ingredient so I ordered a few pounds of carrots from my local farmer. 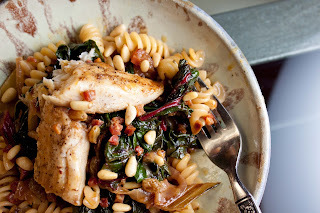 With the cold weather seeping into the midwest, my mind is turning to warm and hearty dishes. I set to work on a pasta carrot sauce, which turned out great. Then I used that sauce in a vegetarian lasagna. The photos are done, the recipe is written. All that was left to do was write up the post. Extra carrots remained in my fridge though, and after all the heavy dishes I had just created I longed for lighter, summer fare. Plus I had a pile of shaved carrots leftover from the lasagna. So I tossed them into nutty, garlicky dressing and didn't look back. I'm not entirely ready for heavy fall food and that's okay because we have a number of winter months ahead of us. This incredibly simple salad fills me up without weighing me down. It's another fat and happy recipe swap success! Fall is is just another name for squash. 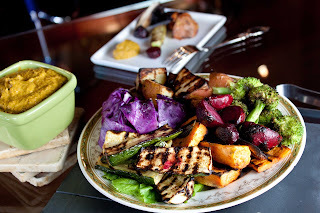 And while I love a good roasted squash, I can only eat so much of it at one sitting. The outstanding questions is what to do with the leftover squash. 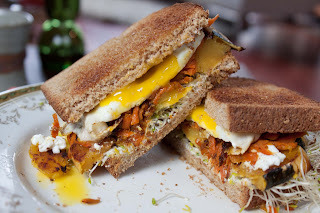 Sear it, add garlicky carrots, goat cheese, sprouts and a runny egg, then smash it between two pieces of toast. Done. An egg sandwich is the bomb and only gets better with the addition of squash. Sauteing the carrots with garlic while searing the squash adds a little crunch to the sandwich while the sprouts add a fresh flavor. This breakfast sandwich came out better than expected- even Dave gave it two thumbs up. I happened to have left over roasted squash, but you can roast a fresh one. Do slice and sear it to get that nice, golden brown crust as noted below. Whip up a new option for squash with this delicious fat and happy squash sandwich. It's perfect for breakfast, lunch or dinner. Everybody has a weakness. First there was Achilles and his heel. Then came Superman and kryptonite. Now it's Monique and popcorn balls. Who knew?? A few weeks ago I asked Facebook fans what type of childhood snack they would like to see recreated. There were some great answers (many of the Fat and Happy viewers had impressive childhoods!) 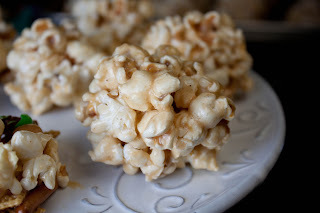 but the one that caught my eye was a boozy popcorn ball. At that moment I knew this would be my Halloween post. Popcorn ball recipes are abundant but there's no real secret to them, just caramel and popcorn. I have an absolutely foolproof soft caramel that I use for drippy caramel needs. And I've created one for Chocolate Bacon Caramel Popcorn; it is the sticky ball portion that eludes me. My first pumpkin batch curdled and was too wet to stick together. It was tasty though so I figured I was on to something. The next rum batch seized up - essentially 1/2 cup of rum makes the caramel too drunk to spread among all the popcorn. Between candy thermometers, hard and soft ball stage, and handling hot molten lava... it's complicated. Here's where it gets simple - a classic marshmallow mixture fills in for the troublesome caramel sauce. Turns out marshmallows are liquor friendly...and rather sticky to boot! Hash never used to be on my favorite list thanks to a college friend who ate hash out of a can. It was dog food with a better label. Actually, I'm not even sure the label was that great either. Fast forward to a time when I realized hash doesn't have to be bad. Homemade hash is good. Downright fantastic, in fact, when made with fresh ingredients. 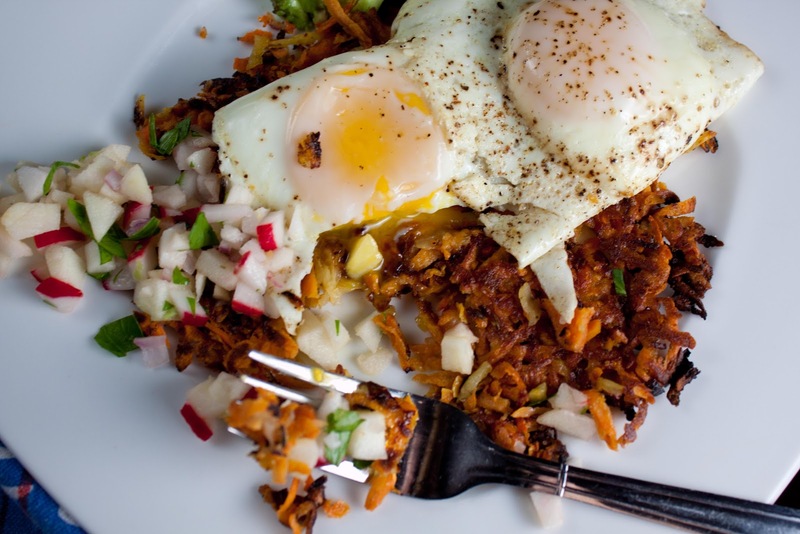 This hash screams to be topped with a runny egg; there is no reason to say no. Sweet potatoes, caraway seeds and tart green apples combine to let this hash recipe skip right to graduate school. Step away from canned food, you'll be fat and happy with tasty, fresh hash for breakfast, lunch or dinner. Did you ever make bread cookies when you were younger, where you took a piece of Wonder bread, removed the crust, smooshed the dough into a shape and then baked it? These cookies are a little like that; a real lowbrow kind of cookie. But one that will you get you through a midnight craving painlessly. Or one that can sub in for a cheap dessert when your assigned dessert guest didn't bring the dessert. Did I mention these are gluten free too? A hell of a lot easier then working with xantham gum and potato flour. 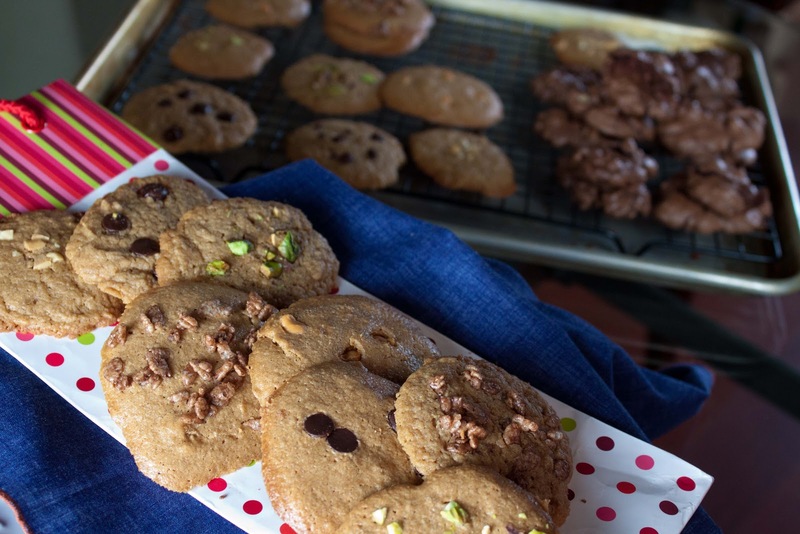 The chocolate cookie is slightly more work than the peanut butter cookie, but worth it. Too me, the topping and optional ingredient is key. I've tried everything from basic chocolate chips and jelly to rice krispies and smashed potato chips. If you are making cookies at midnight, bold toppings are a must. These kinds of cookies are a dime a dozen all over the internet. But now you have them at your fingertips.The base of each cookie is four ingredients, that number will increase if you add the options. Take these cookies for what they are worth - the simplest form of cookie for emergency fat and happy moments. To hemp or not to hemp? Before you answer that question, ask this one: "Are you having a drug test any time soon?" Allow me to explain. I've been using hemp seeds as a source of protein for a few months now. Hemp seeds are nutty in flavor and slightly crunchy. They can be eaten raw, made into milk, prepared as tea or ground into meal. Besides topping my salad, I've be making a homemade hemp milk for use in my morning smoothies. Smoothies that are enjoyed not only by me, but by my guy. Enter a new job opportunity for said guy; an opportunity which requires a drug test. I do the first thing any normal, non-drug using individual would do at this point - I Google it. What I find is hundreds of articles, each one contradicting the last. In a skeptical and wavering voice I notify my SO that he is in the clear; no doubt he felt there was a bit of a white lie hidden in my delivery. But one of us worrying about it was enough. I offhandedly suggested we stop mixing hemp smoothies until the result of the drug test were in as a precautionary measure. In the meantime, my research over hemp seeds deepened. My understanding is that Hemp seeds (and oil) have a range of 5-10 ppm THC. So failing a workplace drug test is extremely unlikely. Unlikely is not a definate, but it's fairly firm. 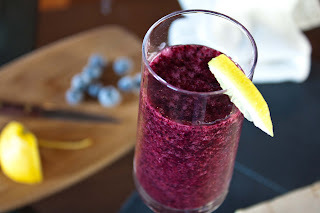 If you need to play the straight and narrow for a few weeks, go sans hemp with my Blueberry Oatmeal Smoothie. It's made with almond milk. 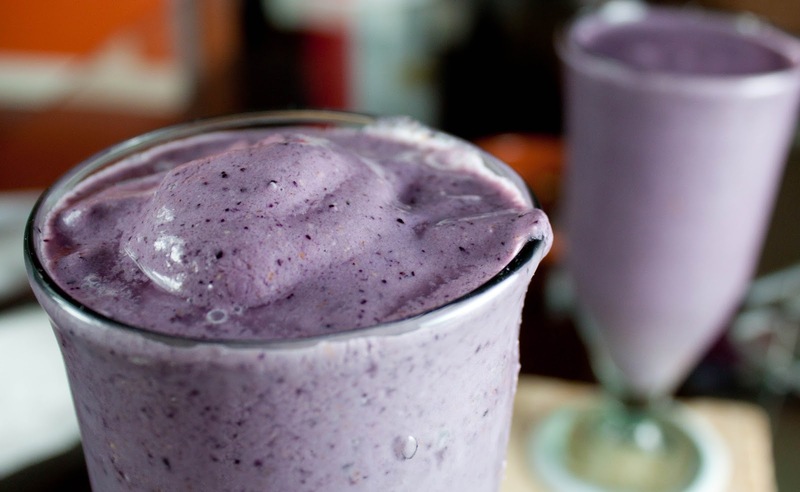 Then, when your results are in, fire up the hemp smoothie for a celebration. Dave and I have had a tradition of Friday night fish dinners for some time now. When or how this started is a faded memory, though it may have to do with deep seated roots of Friday night fish fry's in small Midwestern towns. I love a good fish fry, though I can do without all the breading and oil these days. 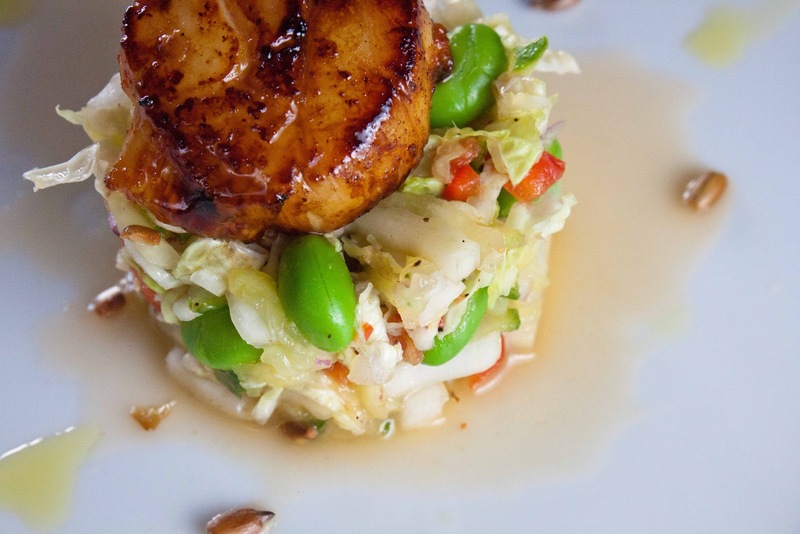 So the challenge is to enhance the fish with a few less calories as well as with fresh, bright flavors. Tonight mahi mahi sits on a cloud of Swiss chard with a simple orange sauce. Fish and greens can leave a person wanting a little more, pasta fills that void. It gives the dish body and texture. Fresh ingredients shine through without using overpowering seasonings. Sure there is a little bacon grease being used in this dish, but sparingly. And pancetta sounds healthier and fancier than than bacon anyway. 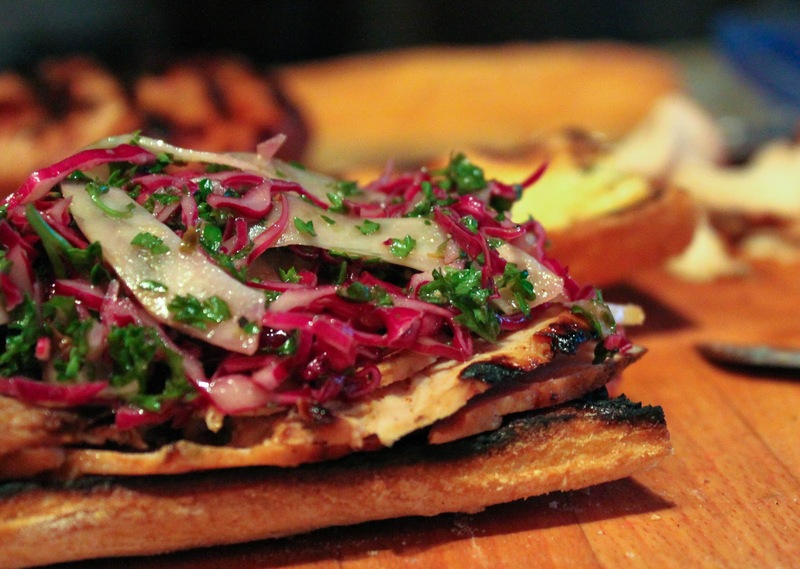 This dish is not limited to Friday nights, so go crazy and try it on a Tuesday! It's a fat and happy fresh fish un-fry. Beets are notorious for showing up on salads. Usually on a bed of lettuce or sprinkled with goat cheese. 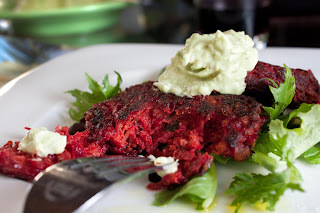 So I wondered why couldn't beets find comfort in a creamy dressing the way chicken, ham and tuna do? 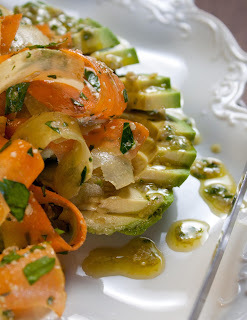 They can and in this recipe they do; only difference is the lightened up dressing. This beet salad is creamy and earthy with a crunchy bite from the celery and pistachios. Pile the beets salad between two hearty pieces of bread along with some kale and you get a super filling sandwich. 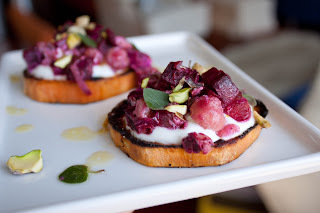 Or try topping a slice of sweet potato for a fun bruschetta appetizer. Either way, beets find a home in healthy fat and happy way. The monthly Recipe Swap challenges a group of bloggers to recreate an old recipe by varying the ingredients or method. These recipes are chosen from old hymnals, pioneer journals and treasured recipe books; often they are quite intriguing. Take this month's recipe for example - pork fruit cake. The recipe literally says to mix all the ingredients (a pound of pork and a pound of currants) and then bake very slowly. Priceless. My recipe goal is to stick with most of the original ingredients while messing with the method. But wanting to be somewhat true to the original recipe, I wanted the pork to be encased in bread. Steamed buns were calling out. But I had an overload of Asian food leading up to my weekend cooking. So I decided to stuff the pork into fresh bread loaf and use the fruit aspect as a compote on the side. I have to admit, time got away from me and and in a rare moment of weakness I decided to purchase the bread rather than make it from scratch. The baking gods wouldn't allow it - there was no frozen bread dough to be found. I was meant to make it from scratch. So I set my alarm for early and kneaded my way through it. What did I end up with? Exactly what it sounds like. 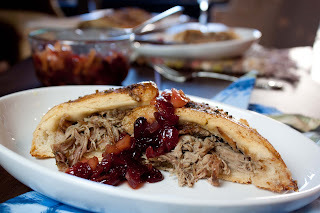 Luscious pulled pork wrapped in warm, buttery, crunchy, doughy bread with a titillating spicy, fruity relish. Freaking yummy! Seriously. There is life in those old recipes yet, you just gotta make them yours. Make this delicious Fat and Happy pork bread in the mean time. We don't eat chicken. Technically Dave doesn't eat chicken; by default that means I don't either...much. This tends to cause a interesting game of hide-and-don't-seek when we are invited to dinner because more often that not, chicken is on the menu. What this all means is that I've learned to bring along non-chicken options that are filling and interesting and can be disguised as side dishes to avoid overshadowing the main dish. It's never a good idea to dominate a meal your host has planned. Many people only think of turkey as a big Thanksgiving meal, but it can be so much more versatile. 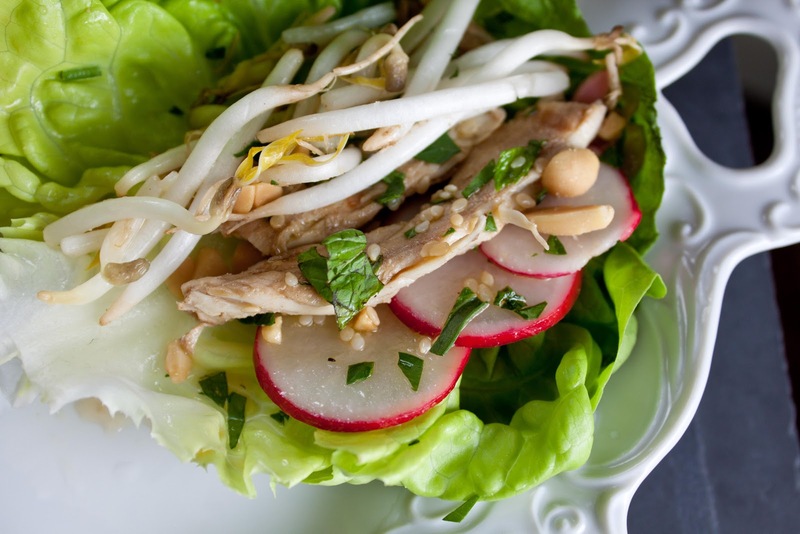 Turkey cutlets allow for simple marinating and quick grilling in these Thai-Asian lettuce wraps; all the usual suspects (ingredients) come into play too: bean sprouts, peanuts and mint. Using lettuce as the bread makes for a lighter, carb-free option that is perfect for a delicate entree or as a simple accompaniment to a larger meal. As a bonus, if you want to save time or feed a crowd, simply tear up the lettuce and toss all the ingredients to turn this into a big salad. These turkey lettuce wraps came with us to a barbecue last weekend and paired quite nicely with the barbecued jerk chicken being served. The host wasn't offended by our addition and Dave had food to eat with no one the wiser - everyone was fat and happy! A close friend is marking half a century. Friends and family from all parts of her life are coming together to celebrate with an evening of elegant picnicking and lighthearted roastings. I struggled with what dish to bring that was carefree, simple to pack and move around and that stands up to the weather. To add to that, I was given her AARP card that showed up in the mail to do something creative with. Let me deviate from the recipe for a moment to say we are talking about a women who has a better body than any one half her age, stunning looks and has the fun attitude to go with it it all. Simply Fabulous! Somehow I landed on the idea of making serving bowls out of copies of her AARP card. From there, it was easy to come up with a snack to fill those paper bowls - flavored popcorn. Two easy recipes but wildy different in taste. 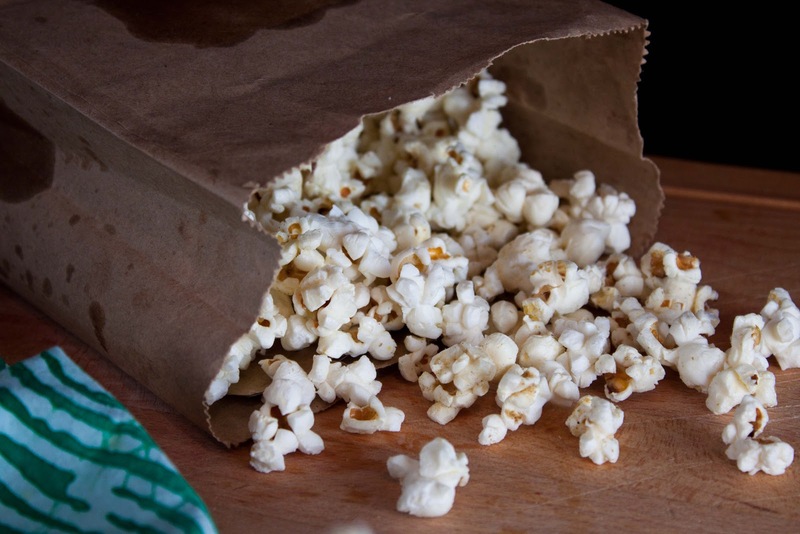 The Parmesan and Oregano Popcorn is rich and buttery while the Indian Spice Popcorn is exotic and finger licking good. Everyone loves popcorn and these are fun, simple favors for all fat and happy ages. Even in the dog days of summer we are typically greeted with one day of impending chilly fall weather. It's a rare opportunity to let summer produce warm us from the inside. This proscuitto and portabella mushroom mixture is absolutely fantastic! I don't want another quesadilla without it. But its more than just a filling, I could see this as an omelet filling or a topping for bruschetta or on a big fat juicy steak. The soup is a simple one chocked full with nutritious veggies; adding the summer squash gives a hearty freshness not found in a typical tomato or pepper soup. 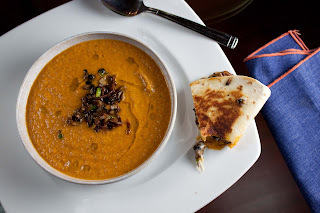 Make any time of the year fat and happy with this delicious soup and quesadilla combo. 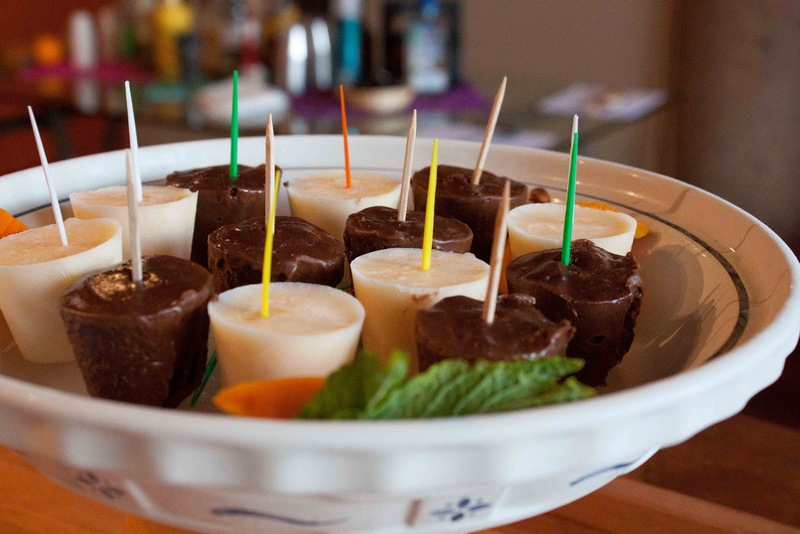 A few months ago we hosted a Fat and Happy Top Chef drinking party. I had won first place, but was disqualified for knoodling with one of the judges! My final entry into the drink contest was a caprese cocktail with a basil-infused vodka followed by a tomato granita. An absolute flavor party in your mouth. Starting out with a taste of dressed mozzarella, you follow with the basil shot which brings around a familiar flavor. The tomato granita soothes the vodka bite with its icy crystals and lands the final salad essence with an undeniable tomato punch. Taking a simple salad and turning it upside down and inside out and then freezing it is an outstanding way to wow your guests. And it is actually quite simple aside from needing to tend to the granita. Use this as an opening to your party or as a mid-dinner salad break to tantalize the palate. Either way it will be a Fat and Happy conversation piece. If there is a downside to buying a watermelon, it's gotta be the looming question of what to do with the reaming after you eat a cup of it. I was staring at a mound of juicy red melon and was saddened at the thought that it might go to waste. Coincidentally, I had planned to make a couple of different variations of gazpacho for an afternoon birthday party. Watching the peppers whirl in the blender gave me the idea to turn the watermelon into a soup. Toasted almonds give this watermelon gazpacho texture while the ginger and hot pepper tingle the Thai senses. 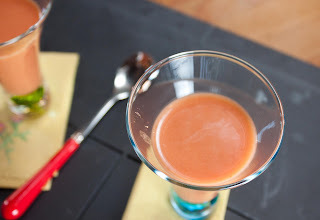 This watermelon soup could be a great appetizer, lunch or amuse bouche even. 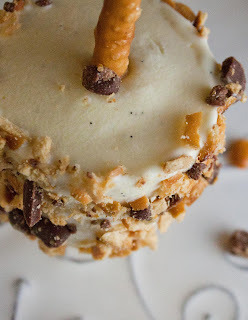 It was a hit at the birthday party and will turn any event into a fat and happy party! Fat and Happy originally started because I have a bad memory when it comes to creating recipes. I'll make something great then forget what it was or how I made it or exactly what I used. So now I have a very sophisticated process - I keep track of my ingredients by scratching down notes on a piece of paper. Then ultimately I type up my notes into the blog. My house is filled with hundreds of notebooks and piles of loose paper with chicken scratch writing and food stains on them. But there are times when I fall back to my old ways, when I assume I will remember all the random stuff I threw in. Then before I know it a couple of days go by, I use up a few brain cells at work and at play ... and BAM. I forgot I made this dip at all. My friends reminded me it was good. Whew. So I'm fairly certain this recipe is close, but feel free to try it out and tell me.Perhaps you will want add a little more of this or a little less of that. Be creative, try out a few things, deviate from the recipe and make it your own. That, my friends, is Fat and Happy cooking! A lot of ice cream gets made at Fat and Happy and there is nothing sadder than old, wasted ice cream. The problem being that ice cream is difficult to share. Between lugging around the ice cream, the bowls, the scooper, the napkins and the spoons and then getting all that back, it's a dang hassle. Solution: ice cream bars. Not only are they portable, but using pretzels in place of popsicle sticks makes these little puppies green too! Of course, I'm a proponent of making homemade ice cream, but not everybody has that option. The best part about this recipe (aside from eating it) is that you can use store bought ice cream and still come out a hero! All you need is ice cream (check out the Fat and Happy Ice Cream archive for amazing, interesting ice cream flavors), pretzels, chocolate and small dixie cups. There are a couple of easy steps involved, so start the night before or the morning of. No more more wasted ice cream. Your friends, kids, guest, coworkers, doormen and mail carriers will go ape over these Fat and Happy, completely edible, ice cream treats and will dive in the moment you hand it to them. Even if it is 7am. Trust me. This isn't quite the slushy texture of the real Slurpees, but it doesn't need to be. 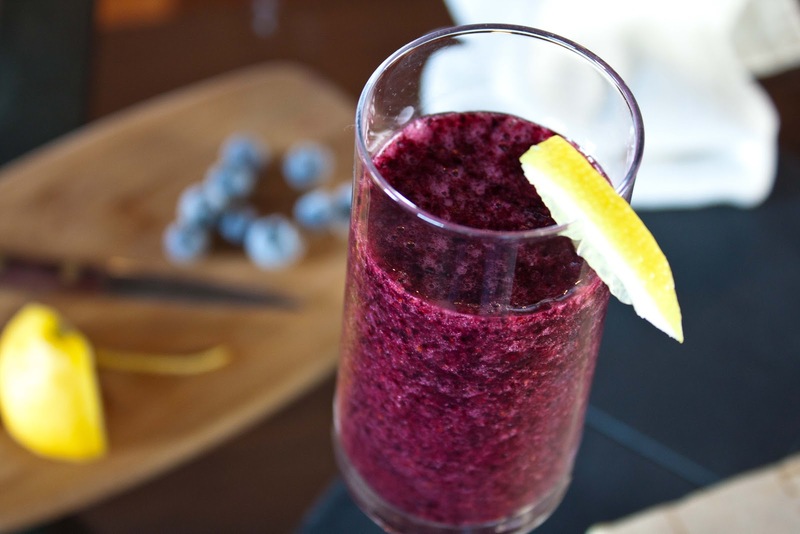 It's cold, refreshing and blueberry-riffic! A perfect fat and happy summer cocktail. Summer conjures up emotions of carefree days and uncomplicated meals. Running through sprinklers and washing cars mean more than slaving in a hot kitchen. It just feels like the right time to simplify life. At the beginning of summer, a jar of Sweet and Hot Pepper Relish came to me as a secret ingredient. Admittedly, this seemed like a challenging ingredient; most people would agree that this is an item enjoyed as is, nothing really needs to be done to it. But my goal with secret ingredients is to make an actual recipe out of it, so I needed to pull out my thinking cap. But summer-lovin means it had to be elementary, like tossing in a pasta dish that has the versatility of being served hot, cold or room temperature. My love for all things pickled and relished is not a secret. I've been known to eat spoons of tangy, fiery and vinegary substances directly from the jar. 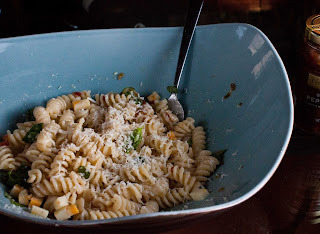 I did question whether the sweet side of the relish would be too sweet for a savory pasta dish, but coupled with the chewy pasta, hot pepers and the salty cheese it worked great. The beginning of July brings a new Recipe Swap; this month's recipe redo is for a classic coleslaw - Oregon Style- from an old recipe book called The Second Ford Treasury of Favorite Recipes From Famous Eating Places. Our goal is to recreate the recipe in our own spin by changing at least 3 ingredients. There are hundreds of coleslaw variations out there already so my creation needed to stand out from the usual crowd. On it's own, coleslaw is a great side salad. 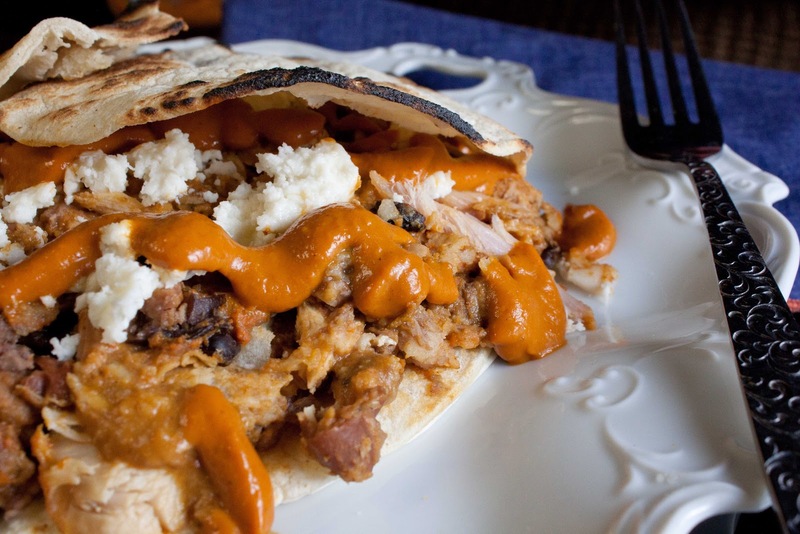 But when you pair it with a main course such as with pulled pork or with tacos, that's when it really shines. Summer vegetables scream to be left fresh so my thought was to create a light summer coleslaw and top it up off with seared scallops. The wasabi just adds a little kick to the whole dish while topping with wasabi peas finishes it off with a whimsical crunch. (if only I had remembered to get them while at the grocery store!) This is a revved up Fat and Happy coleslaw that rises above the classic salad. Happy hour drinks landed a few friends at our house for some wii, a game of darts and a final round of libations. It was one of those nights when the fridge was nearly void of food; thankfully we have thousands of restaurants just waiting on stand by to bring us much needed nourishment. The downfall of the delivery system is the 60 to 90 minute wait. Snacks were need stat! Armed with cream cheese and the remnants of a pumpernickel snack loaf, simple grilled cheese sandwiches were already in the works. I then found a small can of green chilies in the cupboard, just the thing to take these cheesy morsels to the next level and tie us over until the delivery boy made his way to us. Nothing complicated. Nothing fancy. Just peppers and cream cheese melted together on toasted bread. But there is something fat and happy about tipsy snack making. I like to test out different eating styles just to see how my body reacts to them. Recently I decided to give up meat and dairy and gluten. Self torture is one thing, but implementing food limitations on other household members is a whole different story. Mealtimes have become interesting at our house. For the most part, I create dishes that Dave can easily add cheese too, and in some cases meat. I also created a large batch of homemade buns that I put in the freezer for handy additions to his portion of the meal. With the basics covered for Dave, it leaves me pretty open to create anything I want. Today I decided to create a veggie burger, something he could easily top with cheese and place on a bun. I started with a zucchini because it seemed the most versatile; any veggie that can pose as a dessert can't be a bad thing! So a little zucchini, some beets, garlic and seasoning salt all mixed together nicely. The real struggle is the binding ingredient since I'm not using gluten. There was an old Parisian chef who argued that an egg could only be properly prepared by cooking the yolk and the white separately and then bringing them back together to serve. 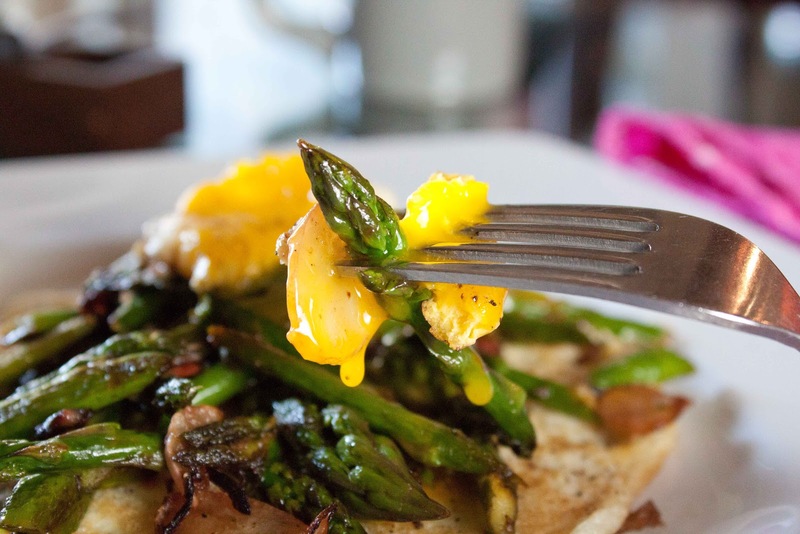 This idea ran through my head as I stared at a carton of eggs and a bunch of fresh asparagus wanting to concoct a breakfast with a twist. Cooking the yolk and white separately seemed like it would ultimately just create a fairly basic fried egg. So I began to whip the egg white with a little spoon of mustard; then I poured that in a hot, buttered pan and cooked it until it was brown. After flipping my make-shift egg cake I added the yolk to the pan and let it all cook for a minute. It was just the creative twist I was looking for. The whites do get an interesting texture similar to a super light frittata that I didn't love by itself; but it was a great back drop to the lemony asparagus with the runny yolk gooing all over it. One of my favorite late night bar snacks is a trio of butter and salt with a side of bacon at 694 Wine Bar in Chicago. 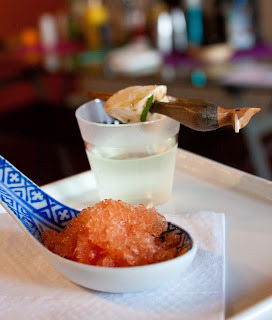 Three amazing butters from three different regions sprinkled with three equally stunning salts. Oddly enough, three of us meet there late at night about every three months to indulge in this cholesterol-raising treat. 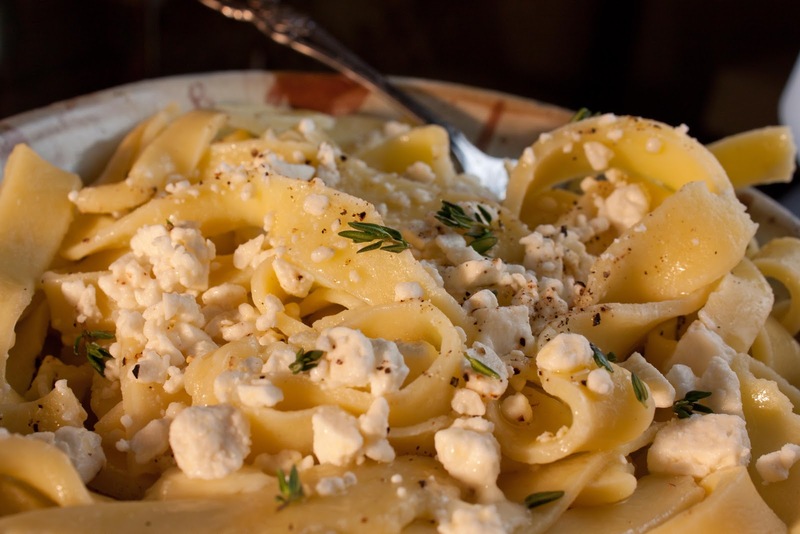 My second favorite butter appetizer is at Cyranos Bistro. 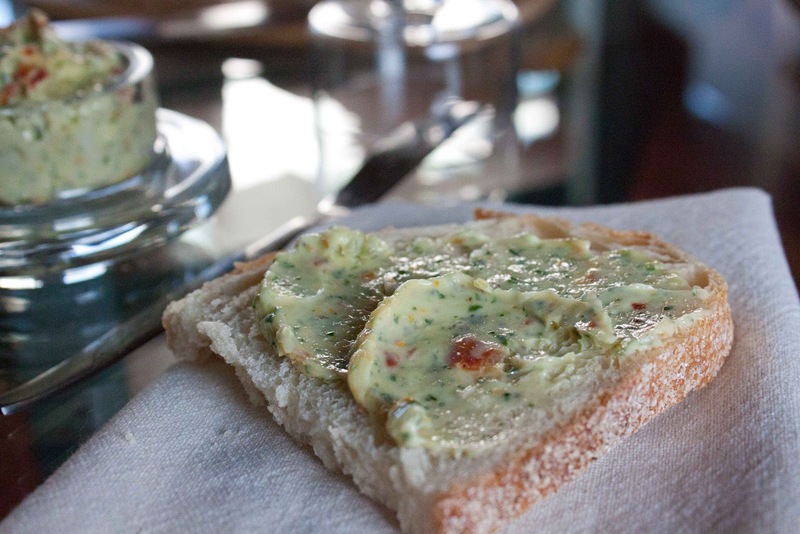 This flavored herb butter is delivered along with a basket of warm bread and it is finger licking delicious. Give me an order of the herb butter along with a house made pate and I'm completely fat and happy. With a party approaching, I wanted to create a touch of restaurant essence at home. With only one butter choice on hand it was an easy decision to make a flavored butter. The plan was to create a butter spread for my homemade buns with the option to add thin slices of ham for a full sandwich. It needed to enhance the meat and also stand on its own melted into a warm slice of bread without overwhelming either. This is when random condiments in the fridge come in handy. A few sundried tomatoes for depth, a little parsley and lemon to lighten it up and a touch of honey to add sweetness - this butter is fantastic! After taking a month off from the Recipe Swap, we are back in full force to kick off the first weekend of summer with our individual remakes of a Chocolate Mint Pie. My first inclination was to make an inside out pie in the form of a crunchy mint truffle using the homemade creme de menthe left over from my shamrock shake adventure. Days before this post was due I received an invitation to a Top Chef Drink party ... being held at my house! Visions of glasses smudged from smoldering rosemary, concoctions bubbling with pop rock inventions and deconstructed cocktails swirled in my head. The only thing I knew for sure was that I didn't have a lot of time to create the winning drink AND prepare for the party. I toyed with chocolate and mint in a drink but I couldn't get past the girly martini stigma surrounding those flavors. A frozen cocktail felt a bit better, but it needed a savory edge, something almost spicy. And it needed a filler. The obvious choice was a Greek yogurt until I remembered a chocolate avocado shake I once made. Avocados are green and so is mint, seemed like a fair swap. Plainly put - life is busy. There are many days I'm just worn down and don't feel like cooking. Those days I'm thankful to keep a pot of cooked quinoa in the fridge, nuts in the cupboard and vinaigrette ingredients for easy fixing. 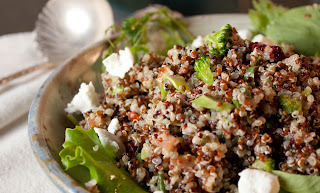 Quinoa is a great substitution in place of rice or any grain really. Toss in a few extra vegetables, a little dressing, serve it on warm on a bed of fresh lettuce and you have a fancy salad. I've boasted about the benefits of protein-packed quinoa numerous times on this blog before so I'll spare you all that dribble again. Quinoa makes for a nutritious meals and is versatile for every day. It comes in a variety of colors too: red, black, orange, purple or ivory. There is no nutritional difference in the various colors though some say the red quinoa has a chewier texture. In this salad I used black, red and ivory quinoa just because whole foods had them mixed in a dry goods bin at a great price. Using a mixture of colors just gives a little definition to the salad. There is a special season that only lasts a few weeks every year and I'm not talking about summer in Chicago. That old adage 'if you blink you will miss it' has never been more appropriate than when talking about rhubarb season. April showers bring May flowers and pretty red stalks of crisp Rhubarb. So many people think they don't like this fruit disguised vegetable; often it's their own preconceived notions or the reminisce of some disgusting goo made by a distant aunt that slithered away on its own accord, just like in the movie Better Off Dead. This is nothing like that and the only place the cake is going in your belly. Strawberry and rhubarb are a natural combination; the striking part of the dish comes when that tart, sweet flavor meets the tangy buttermilk ice cream. It turned out so much better than planned that I offered to make it the very next weekend for another party. It was a good week snacking on this ice cream and cake combination until a trip to the store turned up an empty rhubarb shelf. Rhubarb hunting I went. The next store and the next were all out. The season came and went in less than 2 weeks; looking back I should be happy I was able to bag any. Amuse Bouche is a funny name. It rolls off the tongue okay, but it ultimately comes out like a drunken sailor attempting to fit in at a ladies afternoon tea party. 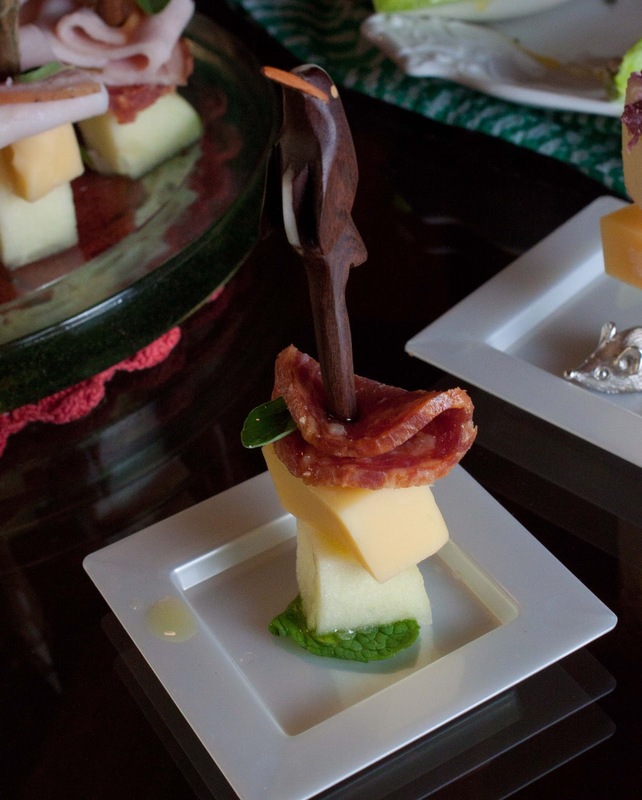 It's a single, bite sized appetizer that is meant to 'amuse' the palate; to tempt the senses for more. Often these are free tokens offered before your meal or between entrees which can help to set the tone of what is to come. It can also be nothing more than showmanship of a chef's oversized ego as well.... but I love the hell out of these singular bites of intense flavors. This can be an easy way to elevate your party and sneak in another nosh without adding a full course to the dinner. But don't be fooled at their tiny size, they can become as much work as your main entree if you let them. 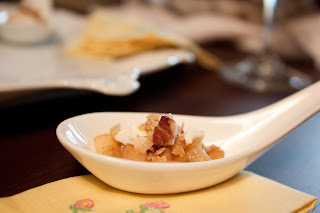 This amuse bouche spoon of sauteed apple meets savory cumin and creamy triple cheese is a fun and simple tempting bite that could be used before a meal or maybe leading into a dessert course. It's a play on the Midwest tradition of adding a slice of cheddar cheese to your apple pie and it's just fun. 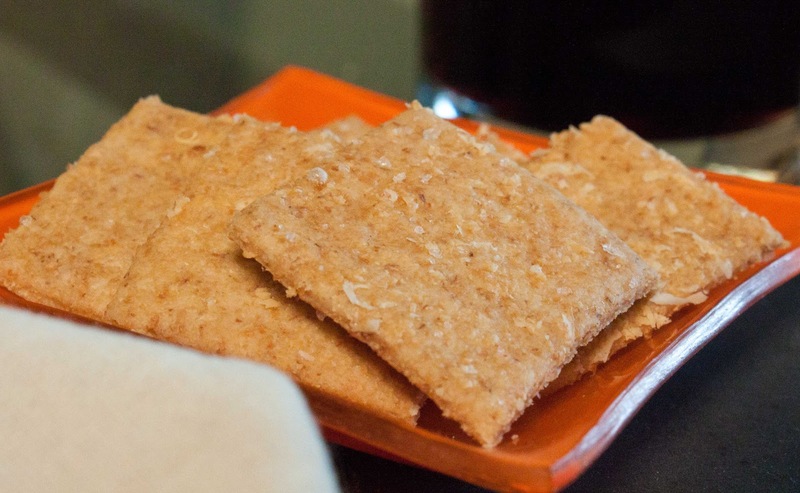 These are not a light, super crispy saltine-like cracker. That's important only after you understand that I set out to make a saltine cracker for my sick beau. The crackers are still good, they just turned out more like a wheat thin. A tasty, tasty wheat thin. Using white wheat lour instead of all purpose white flour deepened these crackers in appearance, depth and flavor. This really couldn't be a simpler dough and process. The most difficult part is rolling out the dough as it tends to be on the crumbly side, unless you added a pinch too much water, then the dough might be on the soft side. Just have patience. And remember that little cracks in the final product makes it look more rustic. You decide to have a party for Cinco de Mayo- yet your Southern friends want to know if they can view the Kentucky Derby as well? Could be a fun mix of cultural exploration. But how are you going to pull off the the food and drink to satisfy both? Margaritas and stuffed pork quesadillas versus mint juleps and Benedictine cucumber sandwiches. Of course, we all know each event has an immense more to offer than tacos and bourbon, but today we are seeking one recipe that can tie them together seamlessly. This Spicy Strawberry and Mint Grilled Cheese Quesadilla Sandwich is a crazy exploration into marrying these two festivities through one recipe. Imagine you are walking around the party while munching on a warm, cheesy quesadilla and you trip - but catch yourself by landing your cheese filled hand into a fellow party-goer's mint julep, which proceeds to knock into a bowl of fresh strawberries. Yup, that's what this is. Cue the fireworks. Sure it's far fetched, but it could happen. 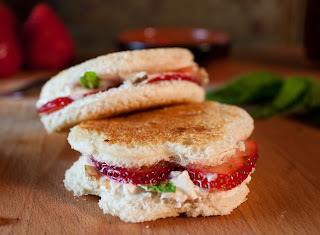 More important is the how the warm Grand Marnier kissed goat cheese envelopes the sweet strawberries and fresh mint. Simple toasted walnuts add a touch of luxury and refinement to the sandwich while the spicy jalapeno jelly lingers on the tongue. I know it sounds odd, but it's a fun little appetizer; could even be a light lunch on the right day. Boring salads are dead to me. We've all seen the same salads topped with the same dressing for decades. Don't get me wrong, I love a good balsamic vinaigrette on field greens; but why stop there? 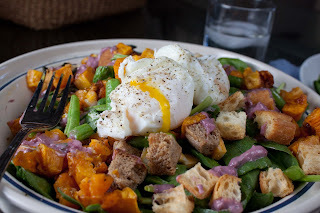 This spinach salad celebrates a mix of farm goodies from squash and sage to green beans and eggs. Blackberry jam stands in for the flavor role in the dressing and it's surprising how well it combines with the roasted squash. Topping the salad with a poached egg is genius. The runny yolk dripping over the entire thing adds a richness that helps the salad become a satisfying meal. Don't stand for blah. put something interesting on your Fat and Happy plate today. It's Dave approved too! Grilled meat as far at the eye could see. That pretty much sums up Argentina. One of my favorite grilled grub was the simple street meat we encountered on our final day in Buenos Aires. Along a bike path overlooking a bird sanctuary, we encountered a mile-long stretch covered end to end with street vendors slinging grilled sandwiches. The real difference filled dozens of large bowls strewn out on long brightly colored tables. Each bowl carried a mystery topping and no two looked alike. Marinated tomatoes, pickled onions, salted lettuce, chimichurri salsas, and even a creamy blue cheese-like concoction. Every bowl held a different flavor and an opportunity for endless sandwich creations. Hungry patrons weren't limited by standard American trimmings of ketchup, mustard and pickles. Next to the infinite salad topping accoutrements sat unlabeled squeeze bottles oozing with local goodness. Regulars grabbed their favorites with ease while we stood baffled by the countless choices. Tip: ordering your sandwich 'completo' will gain you a slice of ham and and a fried egg. Many friends and family in my life are living a gluten free lifestyle. It would be rude of me to ignore their desire for a big bowl of freshly made pasta while the rest of us sit stuffing our faces. Rolling by hand rather than on a pasta machine, cooking in simmering water rather than boiling- gluten free pasta requires a delicate touch and a light hand, but it really is worth it. It eats the same - absolutely wonderful tossed with simple butter, fresh herbs, black pepper and cheese. 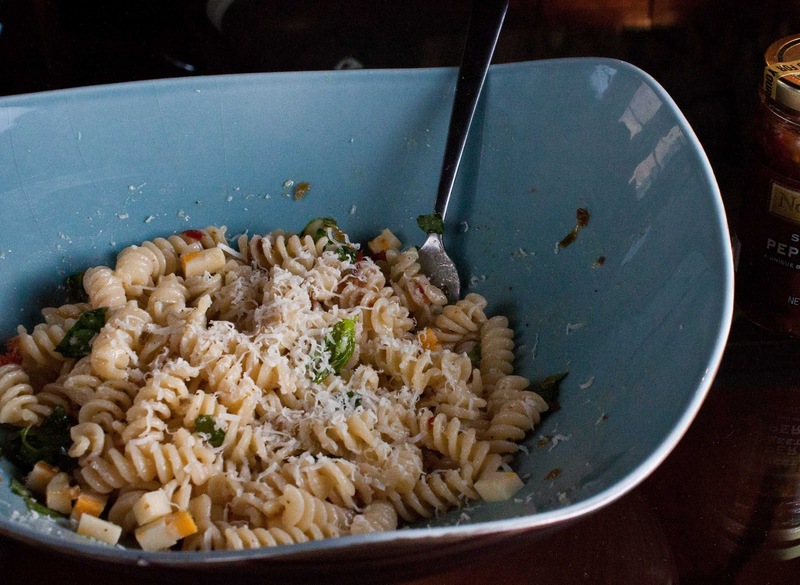 It took me many rounds of trial and error, but with the help of the right flour, this pasta can pass for gluten eaters too. I'll never forget the day I placed a pile of fresh, gluten free ravioli in front of my friend Amy. At the first bite she was transported to more comforting time when white flour was not the enemy. She ultimately came back to the present to tell the tale that this was her first ravioli she's had in over 15 years. I swear there was a tear in her eye at the time. 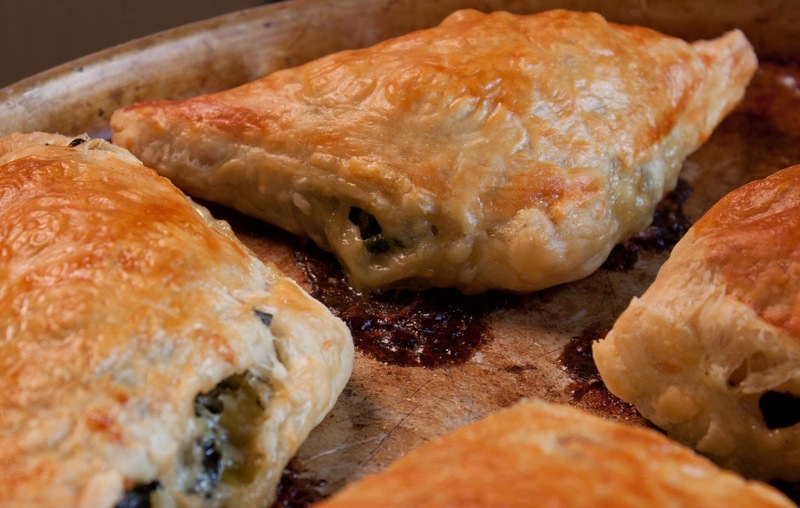 A true empanada, whether Argentinian or Spanish, would be wrapped in dough made from scratch; however not everyone wants to or has time to undertake scratch dough. That's where frozen phyllo dough steps in to produce a delicious mock empanada. Light, airy and crunchy pockets of dough stuffed with sauteed garlicky spinach and melted rich white cheddar cheese.... whether you call it an empanada or a spinach pie, it's filling, tasty and flat out outstanding. Eat these while hot or at room temperature with a fresh side salad. mold. Fill the mold with cake batter, bake, cut the cake in half and add some filling. It looks like a giant sandwich. Peanut butter and jelly seemed to be the obvious choice, but since I tend to follow the least traveled path my flavors skewed toward an Indian edge with cardamom, pistachios and orange. But my homemade orange jam turned bitter on me. So a jar of sour cherry spread filled in and completely hit the mark! 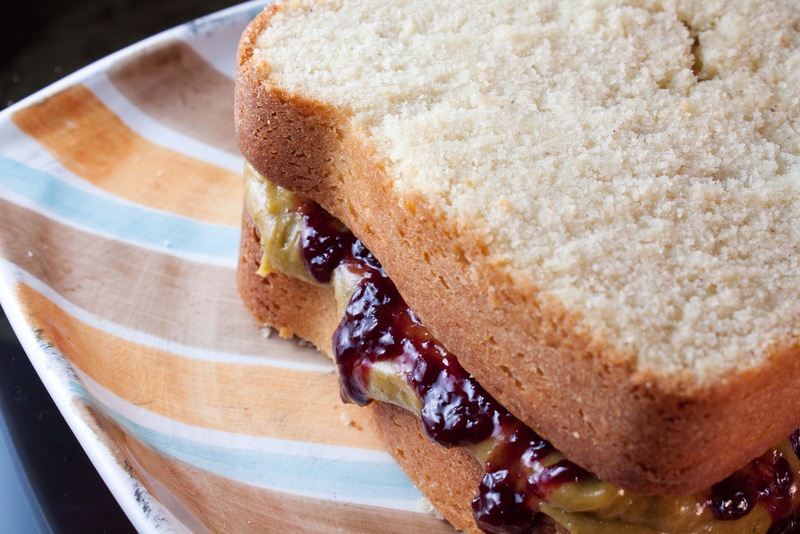 The whole thing becomes an adult play on the PB & J. The cake is dense with a tender crumb while the pistachio filling gives it richness that gets a kick from the sour cherry jam. 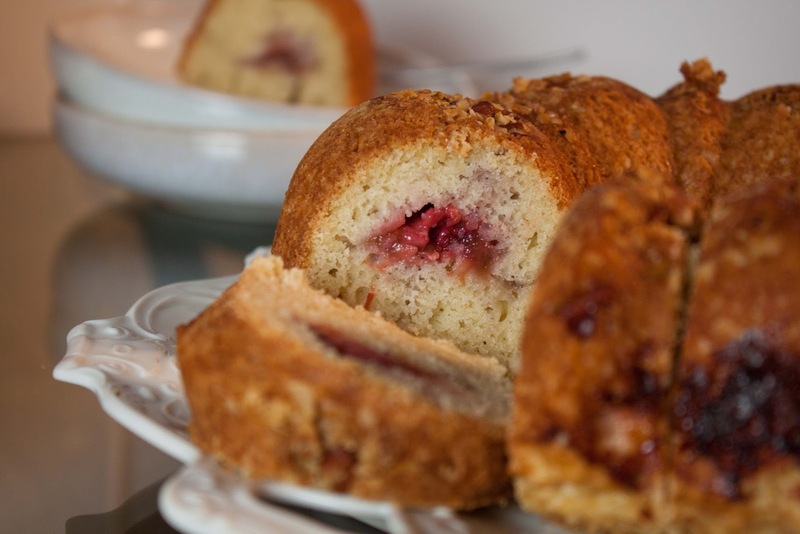 It's a very different cake; a fantastic break from traditional cake flavors. 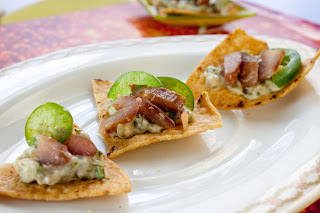 I love to have easy appetizer recipes in my bag of tricks for those unexpected, last minute parties. Or just for lazy Sunday afternoon snack time. 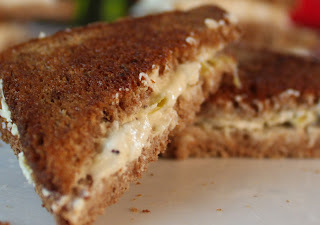 Smoked fish nestled in an herbed mayo with salty capers get a touch of sweetness from golden raisins while a paper thin jalapeno slice finishes the whole crunchy bite with a sliver of heat. This recipe comes together in minutes, assembling each one might take longer than mixing it all up. Check your cupboard because you might even have most of the ingredients already, except for the smoked fish. Bookmark or print this Fat and Happy appetizer, but don't tuck it away too deep. You never know how quickly you may need a simple recipe. 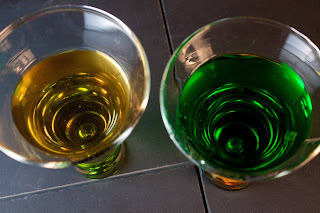 Recently I came across a couple of different recipes for making homemade creme de menthe; with St Patrick's day right around the corner and visions of shamrock shakes clouding my judgement, how could I say no. Both recipes are great in their own right. 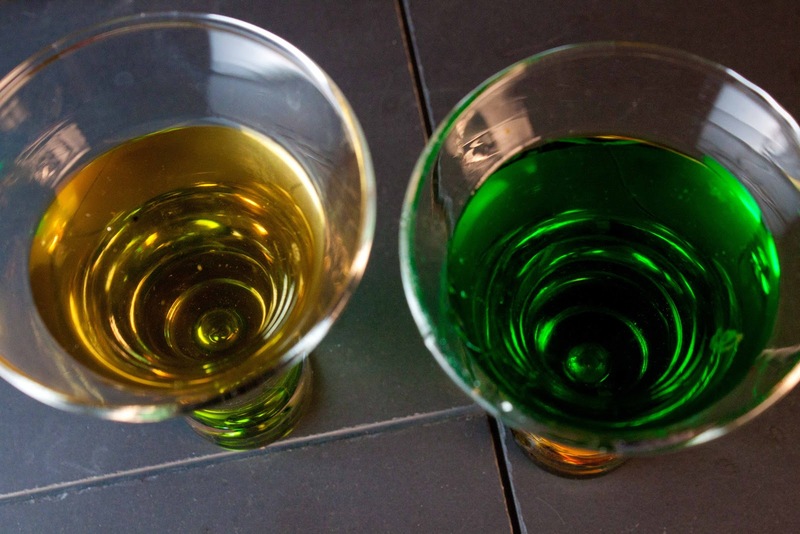 The first is very much a knock-off of the classic green, bottled creme de menthe and only takes minutes to make. While the other is a more refined, upscale, sipping (if you will) creme de minth. If you are short on time go with the quick option and you won't be disappointed. For the longer, steeping version I used natural cane sugar my sister brought back from Hawaii for me (another successful secret ingredient!) and I opted to let the color be natural rather than fake green. This method takes 2 days for steeping but the result is a subtle, almost caramel-ly mint liqueur. In both cases I preferred these chilled and opted to keep in the refrigerator for storage. Now the questions is what to do with the creme de minth. This time of year it only makes sense that a shamrock shake is warranted. But rarely can I stick with the easy options; I wasn't looking to make a difficult recipe- just to elevate this yummy shake. The simple addition of fresh basil added to layers of mint shake and chocolate cookies and you've got a fricken delicious dessert! There was a time when February 14th wasn't fair. It wasn't fair to women. It wasn't fair to women because there was so much emphasis on them, they didn't get the chance to give back. Not properly. The flowers, the candy, the romance; none of this is for the man. But that was all before. Now there is March 14th, one month after Valentines day. Steak and a BJ day: a day for men. Both are equally as important, but this is a food blog so I will focus on the steak and leave the BJ techniques to the bedroom bloggers. There are some pairings to be discussed. What kind of steak will you be serving? And what will you serve with it? Steaks are a matter of preference. Rib Eye is one of the tastiest and juiciest steaks thanks to a lot of extra fat. The Porterhouse and T-bone are manly cuts with a T-shaped bone (adding more flavor), the latter tends to be a little tougher. The strip steak is common and a good cut of meat without the bone. Flank steak can be tough but so good when marinated and sliced thin. 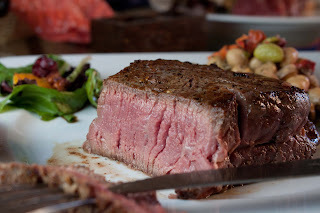 The most prized cut of beef is the Filet Mignon with considerably less fat, fork tender and great flavor. Some see this as a women's steak because it is so tender. It's worth finding out which cut your partner enjoys. Go easy on the potatoes and the heavy rich sauces to allow the meat flavor to shine through. There are so many great marinades and sauce recipes available but this cut doesn't need, save those for a cheaper cut of meat. 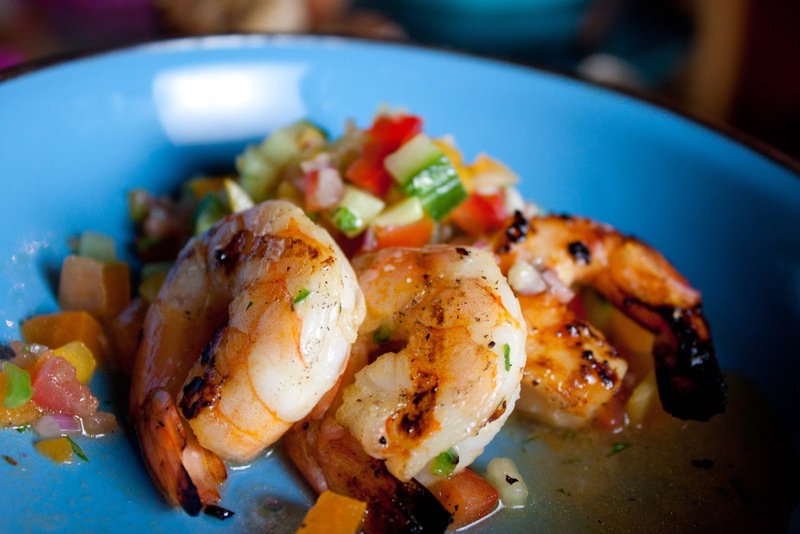 Serve with a simple mango, chickpea or quinoa salad instead. The Monthly Recipe Swaps are meant to challenge a group of food bloggers to recreate a recipe from its original intention. Our chosen recipe for this month is a pizza in the simplest form. Now I love pizza as much as the next person -though I'm impartial to my grilled flat bread pizzas I've been concocting for decades. But the goal of the swap is to create something new, a variation of a pizza. I wanted it to be simple but have the essence of pizza. Life has become so busy that my latest kitchen mantra is fast, easy and simple. That means a yeast crust was out; not that working with yeast is difficult but I wanted a quicker recipe with no assembling and proofing time. What if the toppings were inside the dough itself like a pizza bread? Or a pizza stick. 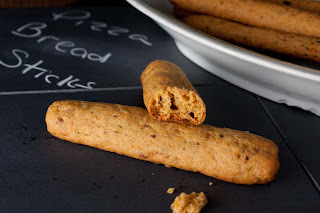 A bread stick filled with pizza toppings. It could work!